My Malaysian Indian Fish Curry. Any different compared to the rest of the Indian fish curries from other parts of the world? I don't know. In fact better not for me to comment. But if you asking about this My Malaysian (Sambal Tumis Ikan Pari, Fried Kembung Assam Sauce & Chilli Soy Fish) Fish Curry, I can tell you pretty much. My own mix of curry paste (Assam Fish Curry) out of store bought spice powders and I added radish. Radish? Indeed. Have you tried? 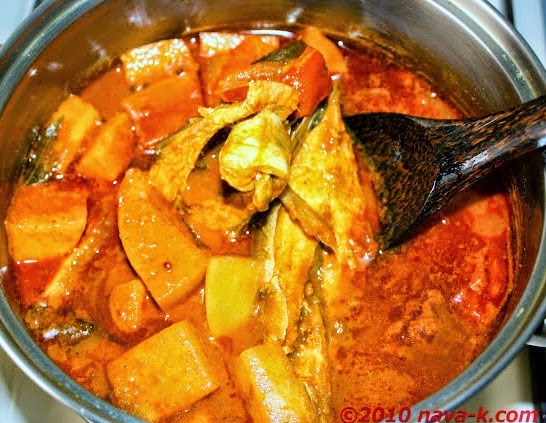 Fish curry with radish? You should. Wouldn't you agree that sometimes we want to vary the type of fish curry we make and and this, Malaysian Indian Fish Curry? Oh what a fish curry joy. Simply one of the best and simply for striking your fish curry food cord. ** Mix these ingredients together with some water for a thick paste. Heat oil and when heated, splatter mustard and fennel seeds. Put in curry paste. Cook over low heat till aromatic and oil splits. Put in tomato, radish, and curry leaves. Pour in 1/2 liter water and tamarind juice. Stir and cook to heat through. Gently drop in fish, stir and let it cook. Mouth watering, aahh I feel like eating it.